Place the mashed potato, flour, baking powder and cheese in a large mixing bowl. Season with salt and pepper if the mash is not already seasoned. Mix gently. Whisk the eggs briefly with the milk to combine, stir in the chives. Fold the egg mix through the potatoes until a fairly stiff dough forms. It should be like wet mash. Brush the plates of the waffle maker with melted butter. Cook according to waffle maker instructions till crispy. Don’t lift up the lid until they are done as they could fall apart. Meanwhile grill or fry the rashers until very crispy. Leave to cool then crumble or chop finely. 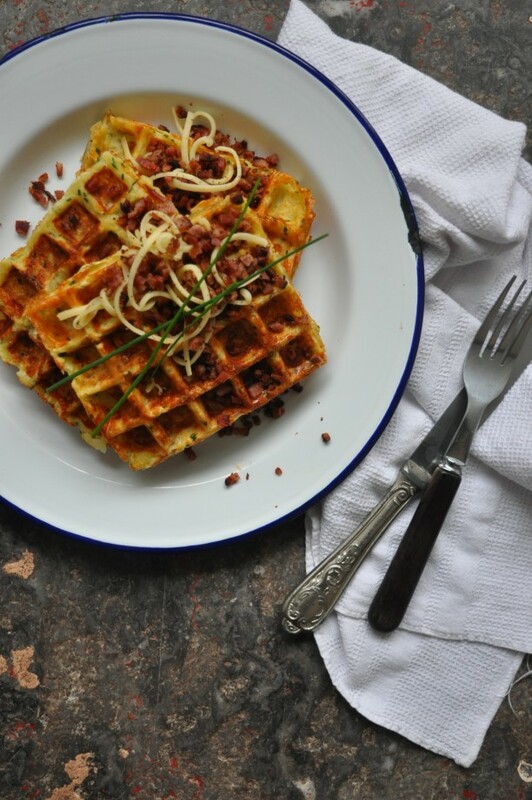 Serve the waffles hot sprinkled with the bacon crumbs and some more gruyere.